A Middleware library for adding security headers to your Vapor application. These headers will help prevent cross-site scripting attacks, SSL downgrade attacks, content injection attacks, click-jacking etc. They will not help for any attacks directly against your server, but they will help your users and help secure sensitive information (CSRF tokens). Please note that this library does not guarantee anything and nothing is ever completely secure. The default factory will add default values to your site for Content-Security-Policy, X-XSS-Protection, X-Frame-Options and X-Content-Type-Options. Note: You should ensure you set the security headers as the last middleware in your MiddlewareConfig (i.e., the first middleware to be applied to responses) to make sure the headers get added to all responses. let cspValue = "default-src 'none'; script-src https://static.brokenhands.io;"
Each different header has its own configuration and options, details of which can be found below. If you are running Vapor on it's own (i.e. not as a CGI application or behind and reverse proxy) then you do not need to do anything more to get it running! Both web servers should pass on the response headers from Vapor without issue when running as a reverse proxy. Some servers and providers (such as Heroku) will inject their own headers or block certain headers (such as HSTS to stop you locking out their whole site). You will need to check with your provider to see what is enabled and allowed. Content Security Policy is one of the most effective tools for protecting against cross-site scripting attacks. In essence it is a way of whitelisting sources for content so that you only load from known and trusted sources. For more information about CSP, read Scott Helme's awesome blog post which tells you how to configure it and what to use. The API default CSP is default-src: 'none' as an API should only return data and never be loading scripts or images to display! You can set a custom header with ContentSecurityPolicy().set(value) or ContentSecurityPolicyConfiguration(value). See Google Developers - The Reporting API for more information on the Report-To directive. Check out https://report-uri.io/ for a free tool to send all of your CSP reports to. The above blog post goes into more details about this. Strict-Transport-Security is an improvement over 301/302 redirects or HTTPS forwarding. Browsers will default to HTTP when you navigate to an address but HSTS (HTTP Strict Transport Security) tells the browser that it should always connect over HTTPS, so all future requests will be HTTPS, even if you click on an HTTP link. By default this is not turned on with the Security Headers library as it can cause issues if you haven't got HTTPS set up properly. If you specify this header and then at a future date you don't renew your SSL certificate or disable SSL then the browser will refuse to load your site! However, it is highly recommended as it ensures that all connections are over HTTPS, even if a user clicks on an HTTP link. The default configuration is max-age=31536000; includeSubDomains; preload. This tells the browser to force HTTPS for a year, and for every subdomain as well. So if you specify this, make sure you have SSL properly configured for all subdomains, e.g. test.mysite.com, dev.mysite.com etc. The preload tag tells Chrome that you want to be preloaded. This will add you to the preload list, which means that the browser will automatically know you want an HTTPS connection before you have even visited the site, so removes the initial HTTP handshake the first time you specify the header. However, this has now been superseded and you should now submit your site at https://hstspreload.org. This will add your site to Chrome's source to preload it in the future and it is the list that other browsers use as well. Note that it is difficult to remove yourself from the list (and can take months to get it rolled out to the browsers), so by submitting your site you are effectively guaranteeing working HTTPS for the rest of the life of your site. However, these days it shouldn't be a problem - use Let's Encrypt! Note: You should be careful about using this on deployment sites such as Heroku as it may cause issues. The Server header is usually hidden from responses in order to not give away what type of server you are running and what version you are using. 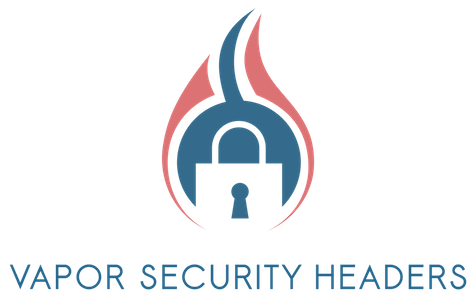 This is to stop attackers from scanning your site and using known vulnerabilities against it easily. By default Vapor does not show the server header in responses for this reason. The Referrer Policy is the latest header to have been introduced (the spec can be found here). It basically defines when the Referrer header can be sent with a request. You may want to not send the header when going from HTTPS to HTTP for example. I won't go into details about each one, I will point you in the direction of a far better explanation by Scott Helme. This release contains major improvements to using CSP with the security headers. The API for adding it now includes a much nicer Swifty solution. Check out the README for more details! #10 Add support for Vapor 3! See the README for usage details. Adds support for Vapor 3! Things still work mostly the same, you just need to change how you register the middleware for Vapor 3. Note: Per page CSP configuration requires an additional service to be registered.